Hi, this is Sandy with my first-ever review for the NosillaCast. 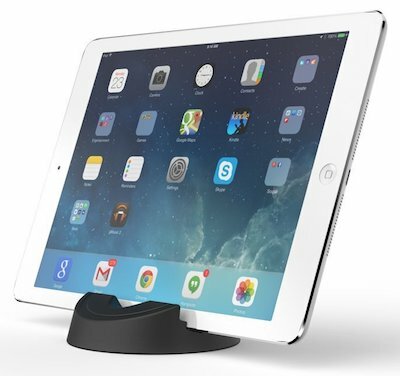 Today I’m going to give a brief overview of a very versatile stand for iPhone and iPad. What’s new about a stand, you ask? Nothing, of course! But this one has many possibilities in a very simple, yet effective form. It’s called “stump” for a reason, as it looks rather like the tilted stump of a tree. 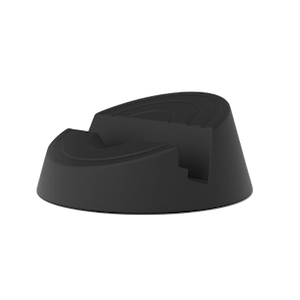 It’s made of some sort of rubberized material and is hefty enough to reassure the user that an iPhone or iPad is not going to fall over. There’s a slot in the tilted top, and that slot is wide enough for either device (iPhone/iPad) and deep enough to hold them steady — even my 9.7” iPad Pro. I don’t have the larger size iPad Pro, so I couldn’t really give a recommendation either way on that one. However, because of the slot and the tilt of the top of the Stump, there are options for using this stand. I most commonly use it with my device in portrait mode, which works fine, even with the “smart” cover on my iPad folded to the back. Alternatively, if I want to charge the device at the same time as I’m looking at something on it, I can put it into landscape mode in the slot. Finally, because of the rubberized surface, I can even use the Stump as a sort of brace for angled viewing. I’ve had my Stump for several years now, and it shows no signs of wear, despite daily use. It comes in a variety of colors for around $25 each, or — on the stumpstore.com web site — you can buy three for the price of two.